Roadtrip 2014 – Yellowstone – The beginning – vegan in your city. The drive to Yellowstone from Glacier National Park, and through Montana was lovely. Possibly one of the most remarkable drives we’d taken on this road trip. We started out on US 89, 287, 191 and worked our way up through several National Forests and historic sites, stopping occasionally, but mostly just pushing on, enjoying the rich diversity of terrain and elevations between Glacier and Yellowstone. We stopped in Helena, Montana to pick up a few provisions and grab a bite to eat and drove on. 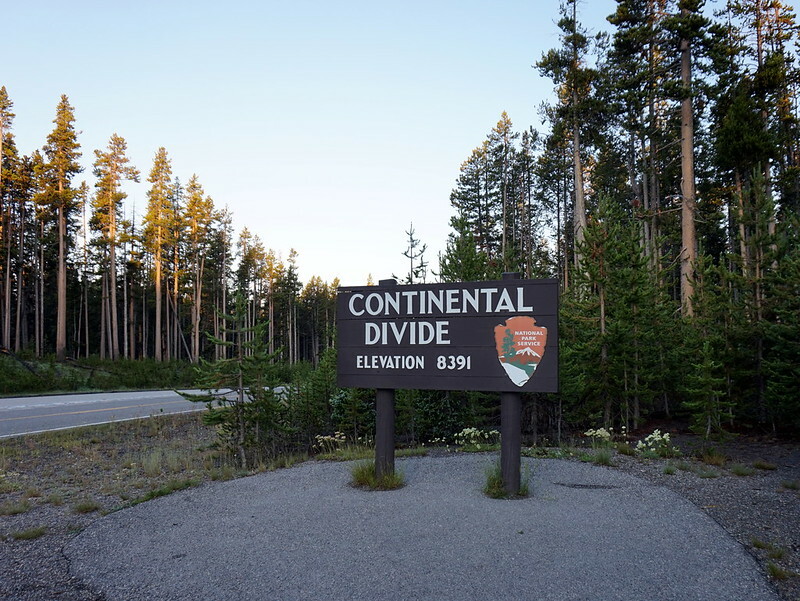 We also, as tradition dictated – stood beside the Continental Divide sign. This time at an Elevation of 8391. We arrived in Yellowstone, through the West entrance, in the late evening just a few hours before sunset. 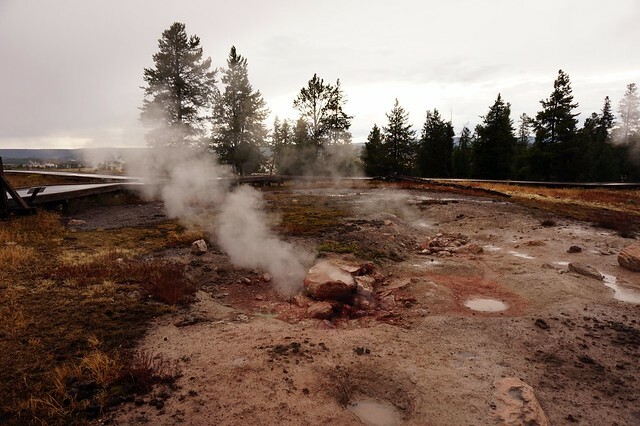 The whole length of the road has inviting signs sending you on to different sites and drives and campgrounds, so we stopped to take a look at Fountain Paint Pots, and Old Faithful before heading to our pre-reserved site in Grant Village Campground. Fountain Paint Pots was a great walk through with amazing colours, bacterial mats, springs, mud pots, steam vents, geysers, and a long stretch of boardwalk. I was happy we ended up there in the evening, in the rain, because the steam was even more dramatic in lower temperatures, and it was just nicer to be outside in the sunset than the sunny +30 C temperatures we’d experience during our subsequent days in Yellowstone. 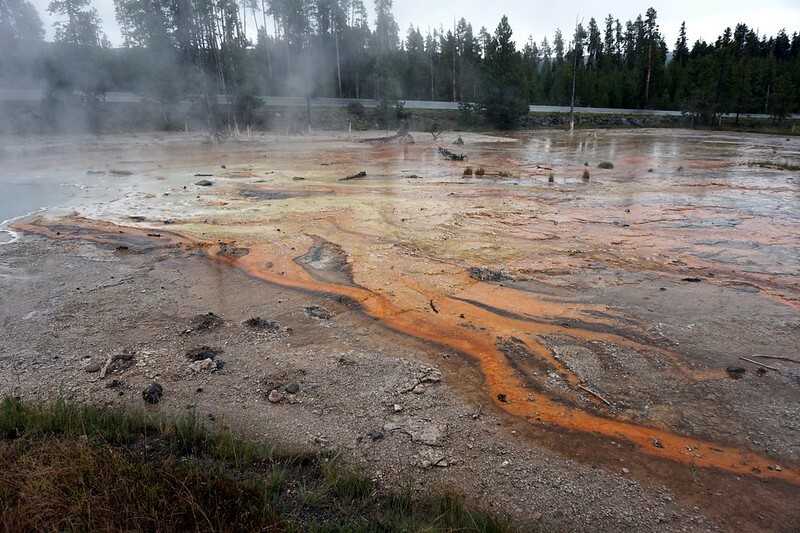 It was our first taste of the incredible alien wonder that Yellowstone contains. There are parts of the park that feel so foreign, so incredible, that it’s like stepping on another planet. I still think about Yellowstone, and genuinely look forward to visiting again. There is so much to explore that we didn’t even get to see. Shortly after Fountain Paint Pots we stopped briefly at Old Faithful to check on it’s next burst (we’d missed it by a few minutes, but it was cool to see this iconic area after most people had cleared out. You can also find useful information at this site, like which first-come-first-served campsites were booked. Yellowstone was beautiful. Except for our campsite for the first night. We arrived late in the evening, and so I imagine that’s why we got one of the the various worst possible camping spots, but I don’t know. If you’re tent camping in Yellowstone, and think, man, I should reserve a spot at Grant Village, if you can – avoid getting K371 or K370. I think the hunger and long drive, and the otherwise exceptional camping sites we’d had up until that point only compounded the disappointment, that and we’d been using this day as a significant timing point in our travels. I had booked at least a few months in advance, and after all of that Yellowstone build up, it was really just a total let down. But luckily after being bummed out, we made a plan. Reserve a spot for a night (or stay somewhere nearby), even a crappy one, so you can do this too, especially in the Summer when Yellowstone is at its busiest. There are so many other campsites you can get in Yellowstone, and they are just first come first served. It’s just a matter of getting there early enough in the day to claim a site when someone leaves. 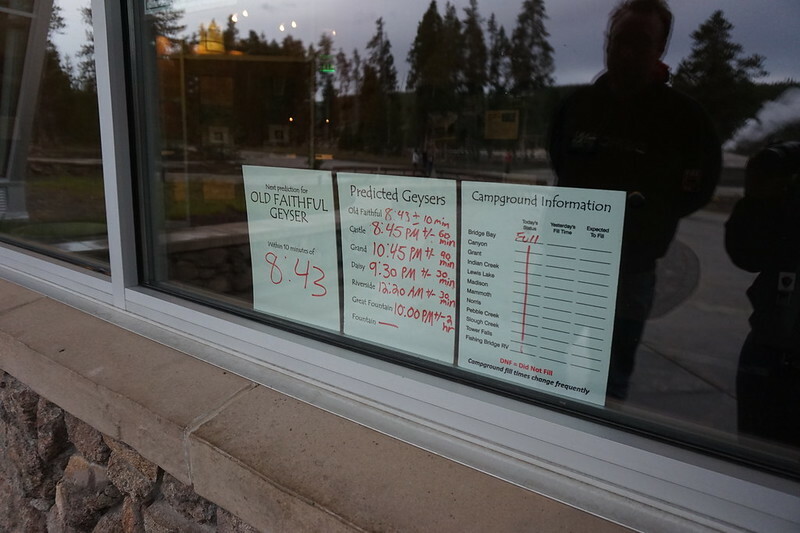 The rangers also keep track of which campsites are full or empty and list it up at visitors information centers – like the picture above at Old Faithful. Claiming a site is easy, we went to the Norris site first thing in the morning and skulked around looking at campers’ exit dates and seeing who would be going soon. Someone flagged us down since they noticed we were circling around and we took over his spot as he left. And we booked the site for two more nights, and then everything from then on was amazing. It was time to explore – but first – showers (back at the Grant Campground). For a good hour. Or what felt like it. If I took away one thing from our adventures that summer it was how amazing it is to have regular access to running water. I have so much more to say about Yellowstone, so hopefully I’ll have another post soon.